Retrospective review of 27 patients presenting as adults with spondylolytic spondylolisthesis. The average age at surgery was 42.9 years. Most patients (21/27) had long standing tolerable axial back pain with symptoms present for up to 156 months. It was however the radicular pain that brought them to surgery. Posterior transforaminal lumbar inter-body fusion (TLIF) was performed in all patients with a median surgical time of 183 minutes and 650 ml blood loss. There were two complications, one a large blood loss of 4 000 ml due to uncontrollable epidural bleeding and another transient cauda equina syndrome after a delayed secondary bleed. Following haematoma evacuation, the latter patient returned to normal neurological status. There was maintenance of a normal segmental lordosis with increased disc height. The fusion rate was 90% by 2 years with a significant improvement in all pain and functional scores (EQ 5D, ODI, Roland-Morris, Health Slider and VAS). CONCLUSION: Although lumbar lysis is largely a benign condition, a subgroup of patients will develop disc degeneration and present with debilitating radicular pain from foraminal stenosis despite minimal listhesis. These patients are well managed with a posterior-based decompression and fusion with the TLIF technique as it provides high radiographic fusion rates with excellent patient outcome. Fredrickson identified the incidence of lumbar spondylolysis to be 6% in the 6-year-old age group.1 This is postulated to be due to the stresses of an erect posture. Some of these children become symptomatic, resulting in early surgery, while most remained asymptomatic throughout their lifetimes. Our study addresses those patients who present in adult life with the consequences of lysis, i.e. accelerated disc degeneration and resultant increasing axial and radicular pain. We present our surgical experience in this specific group of patients managed with posterior-based decompression and transforaminal lumbar inter-body fusion (TLIF) surgery. A retrospective review was performed on all patients with radiologically confirmed spondylolysis undergoing surgery by the senior author (RD) during the period 2002 to 2008. All clinical and radiological follow-up was performed during standardised time intervals of 3, 6, 12 and 24 months post-operatively. This was performed by the fellow without the surgeon's input but not blinded. Clinical outcome data (visual analogue score [VAS], Roland-Morris Disability Questionnaire [RMDQ], EQ 5D, Oswestry Disability Index [ODI] and EQ Slider) were collected pre-surgically and 6 months postsurgically by a research assistant. The main complaint, duration of symptoms, associated complaint and preoperative conservative care methods were collected. Surgical data included procedure details, duration of surgery, blood loss, length of hospital stay and complications encountered. Statistical significance was assessed utilising the paired Student T test. Twenty-seven patients were included in the study, 13 females and 14 males. The median age at surgery was 42.9 years (16.5 - 76.5 ± 16.7). The admission duration was a median of 7 days (5 - 20). All patients were operated on by the senior author. Following surgical exposure, pedicle screws were inserted and bilateral distractors applied to the screw heads. The 'rattle' fragment (Gill or lytic lamina) was mobilised and removed. The lysis tissue was debrided and the exiting nerve root decompressed throughout the lateral recess and foramen. The symptomatic side was selected for the TLIF. The reason is two-fold. First, the TLIF approach ensures excellent decompression and visualisation of the nerve which optimises the resolution of radicular pain. Secondly, TLIF surgery can cause transient neuritis due to nerve manipulation. From a patient's perspective it is better for this to occur in the previously painful limb rather than in the asymptomatic limb. Following facetectomy and retraction of the thecal sac and exiting root, an annulotomy was performed and the disc space completely cleared of disc tissue. The end-plates were prepared for fusion. The locally harvested autograft (lamina, facet joint) was morcellised and placed anterior in the prepared disc space. Demineralised bone matrix allograft was mixed with blood and packed inside the cage itself. The cage was rotated into position and impacted as anterior as possible in the disc space both under vision and then confirmed on lateral image intensification. Residual local and allograft was placed posterolaterally over the decorticated transverse processes. On the facetectomy side, the graft was contained in a Surgicel wrap to prevent spillage into the canal. The levels operated on are indicated in Graph 1. Although these patients only had one lytic level with listhesis, adjacent levels were included in the fusion if stenotic or marked disc degeneration was considered to be adding to the patients' morbidity. The presenting complaint was axial back pain in 21 patients with only four patients complaining of leg pain, one of buttock pain and one of hip pain. All 21 patients with axial backache presented with secondary leg pain as the reason prompting them to seek medical advice. The symptom duration was a median duration of 21 months (2 - 156 ± 40.6). Twentyfour patients were on chronic analgesia at the time of presentation. The median surgical duration was 183 minutes (130 - 255 ± 36.3) with median blood loss 650 ml (250 - 4000 ± 748.5). The median slip according to the Meyerding classification was 1 (0 - 4 ± 0.9) pre-operatively and 1 (0 - 2 ± 0.6) at six month follow up (p = 0.004). Pre-surgical segmental sagittal angle was -24º (40 - -8 degrees ± 10), the negative representing lordosis. Overall this stayed the same at 6 months, -24º (-45 - -5 ± 9.6). The anterior disc height presurgery was 10 mm (1 - 18 ± 4). Posterior disc height was 5 (1 - 12 ± 2.6). At six months the anterior disc height increased to 12 mm (7 - 20 ± 3) and posterior disc height to 8 mm (6 - 14 ± 1.9). Statistical analysis confirmed this to be significant with p values of 0.003 and 0.00009 respectively. These results are summarised in Table I. An angular ratio was determined by dividing the anterior by the posterior disc height (>1 indicating lordosis) revealing a presurgical value of 1.9 (1 - 6 ± 1.3) and postsurgical of 1.4 (1 - 2 ± 0.3). This proved statistically significant with a p value of 0.03. The clinical scoring systems confirmed a significant improvement as summarised in Table II. All total scores had a statistically significant improvement. The EQ 5D scoring system provides information regarding five domains - mobility, self-care, usual activities, pain and discomfort, and anxiety and depression. In the domains of mobility, usual activities and pain and discomfort the difference was statistically significant (p values of 0.00005, 0.0009 and 0.001). In the ten modalities measured by the ODI only personal care and lifting did not have a statistically significant improvement. The overall ODI change was clinically significant in addition to statistical significance as it exceeded a change of 12 points. Fusion was assessed by the presence of crosstrabeculation on an AP or lateral X-ray. Three categories were used, viz. fused, unsure and not fused. 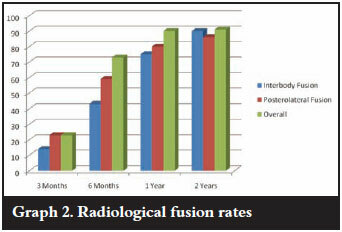 Interbody fusion with crosstrabeculation was present radiographically at 3 months in only in 14% of patients. This increased to 43% at 6 months, 75% at 1 year and 90% at 2 years. If the unsure group (fusion mass evident but not cross-trabeculated) was added, the fusion rate improves to 59% at 3 months, 76% at 6 months, 90% at 1 year and 95% at 2 years. This inter-body fusion occurred both anterior (where graft had been placed) and through the cage. Posterolateral fusion was seen in 23% at 3 months, 59% at 6 months, 80% at 1 year and 86% at 2 years. Corrected for the unsure group, the fusion rates increase to 59%, 73%, 80% and 86% (Graph 2). There was no evidence of instrumentation loosening and no patients required revision surgery. Spondylolisthesis has many causes as classified by Wiltse.4 Our study focuses on the isthmic subgroup with a complete lysis. The pars defect (lysis) disconnects the anterior and posterior columns. With the loss of this posterior column support, especially to resistance of the facets to shear, there is an increased force across the disc. This increased force results in accelerated disc degeneration and subsequent loss of height. This, along with the pseudarthrosis tissue of the pars, results in foraminal stenosis and the onset of leg pain. It is this leg pain that brought the patients to surgery in our study. They experienced a long duration of tolerable back pain, but once leg pain occurred, felt the impact on function and sought resolution via surgery. Once this point has been reached, non-operative care is no longer useful and decompressive/fusion surgery is indicated. Fusion can be achieved by intertransverse bone grafting and pedicle screw instrumentation. In the lytic spondylolisthesis group however the pars defect reduces the available surface area for fusion increasing the non-union risk. Kwon et al showed that posterolateral fusion alone in low-grade lytic spondylolisthesis resulted in a loss of slip angle correction over time and further disc degeneration.5 Their metaanalysis demonstrated an overall fusion rate of 83% and a 75% clinical success rate. Lauber et al achieved 94.8% fusion rate in low-grade spondylolisthesis patients with a TLIF support.6 Madan et al7 concluded that posterolateral fusion has a better clinical outcome in low grades of isthmic spondylolisthesis, although posterior lumbar inter-body fusion is more predictable in maintaining correction and achieving union. The use of additional inter-body technique increases the surface area for fusion. 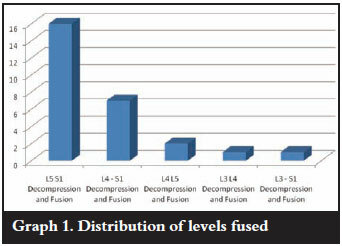 Increased fusion rates can be expected as the graft is under compression as opposed to tension posterolaterally. In addition, the inter-body cage increases disc height and foraminal size. This increased disc height is borne out in our results. The majority of the patients in our cohort presented with longstanding axial pain. It was the onset of a radicular component that prompted them to seek medical advice and ultimately a surgical solution. With relief of both axial backache and radicular pain as surgical aims a posterior approach then allows for a neural decompression, pedicle screw fixation and TLIF procedure. The relevant levels were exposed from posterior and pedicle screws placed with fluoroscopic aid. The neural decompression was done with loupe magnification. The TLIF procedure was done from the symptomatic side, as neuropathic pain from dorsal root ganglion manipulation can be a complication of the TLIF procedure in up to 12% of patients,8 thereby avoiding causing pain on the unaffected side. Distraction between two pedicle screws was applied and a facetectomy performed. The disc space was cleaned out and locally harvested autograft was milled and packed into the space against the anterior annulus. The cage was then filled with bone and also placed under fluoroscopic guidance. The nervous tissue was protected throughout the procedure. The transverse processes were decorticated and further graft packed in these lateral gutters. At the time of this series (2002-2008) the TLIF preparation tools were not as refined as today which adversely affected the length of surgery. There were only two major complications in this group. Severe epidural bleeding was encountered in one patient (4 000 ml) which influenced the average blood loss in this series. Another patient developed a cauda equina syndrome two days post-operatively. This occurred once mobilised and on lowmolecular weight heparin. This was due to a delayed venous bleed and subsequent haematoma compressing the neural structures. The haematoma was evacuated and the patient made a complete recovery in the following weeks. The median hospital stay of seven days is long but explained by state/teaching hospitals admitting up to two days pre-operatively and the ancillary services taking longer. The 20-day admission was an emergency admission of a grade 4 spondylolisthesis who required morphine for pain and was unable to stand erect. Her stay was mostly preoperative while she awaited surgery in hospital. Analysis of both the local sagittal angle and the angle ratio revealed similar results. In both cases very lordotic patients became less lordotic (yet never kyphotic) and patients with minimal lordosis became more lordotic. This is postulated to be due to the inter-body cage increasing the height of the intervertebral space as well as compression posteriorly with the pedicle screw construct when required. With this increase in height, the annulus may well check-rein the correction and thus find its previous (more normal) anatomical position. There was significant improvement in all the clinical scores highlighting the positive impact of surgery in this patient group. This is possibly explained by the indication for surgery being the onset of the radicular pain which is predictably resolved with surgery as opposed to axial pain. Fusion is notoriously difficult to assess but based on plain radiographs, the procedure had a high fusion rate. None of the patients required revision for non-union suggesting that this rigid 360º form of fusion surgery is effective. Although lumbar lysis is largely a benign condition, a subgroup of patients will develop disc degeneration and present with debilitating radicular pain from foraminal stenosis despite minimal listhesis. These patients are well managed with a posterior-based decompression and fusion with the TLIF technique as it provides high radiographic fusion rates with excellent patient outcome. The content and preparation of this paper is the sole workof the authors. No benefit of any form was or will be received from a commercial party related directly or indirectly to the subject of this article.